You know when you look in the fridge and have that blank “what can I quickly put together for lunch that’s healthy and tastes great” stare? Well that’s exactly what happened with this recipe, and the result was perfect! This recipe was inspired by my 2 year old daughter…yes, it really was! I had 20 minutes to eat lunch before I had to head out the door. I opened the fridge, gave it a blank stare, closed it, and decided to venture out in my yard and play with my daughter instead of trying to come up with something quick and healthy to make myself for lunch. Yes, even food bloggers have moments like this all the time. My daughter has recently been on a kick of eating leaves, anything green. And when I mean anything, I really mean anything…she always wants to go into our yard and munch on all the herbs and greens we have growing. Parsley, cilantro, lettuce, spinach leaves, etc., she likes all of it raw. My husband had recently planted kale in our yard, and to my surprise, it’s doing really well! I had yet to harvest it, but my daughter was already wanting to munch on the new greens growing in the yard. So I harvested the kale, washed it, and gave some to her in a bowl. This is when I decided to make a simple kale salad for myself as well. Although as much as I like my greens, I think I need to add a little more substance and flavor to them instead of simply munching on a bowl of raw kale for lunch. This meal really hit the spot and I knew I had to develop it into a recipe to share with all of you. Instead of adding onto what I had already done and making it more complex, I really wanted to keep the initial idea…something simple, quick, satisfying, and easy to make as a single serving. Hope you enjoy it as much as I do. 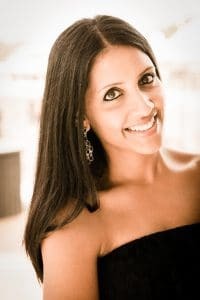 What types of quick meals do you fix for yourself? Let me know in the comments below. It's the quickest throw-together healthy delicious protein-packed green salad! In a non-stick pan, heat 1 teasp grapeseed oil on medium heat. Add the torn kale leaves and carrots. After about 30 seconds, add the maple syrup and brown rice vinegar. Combine and saute on medium-high until the kale is slightly cooked but still remains crisp (i.e. do not cook the kale too long. It should not be completely wilted or dried out.). 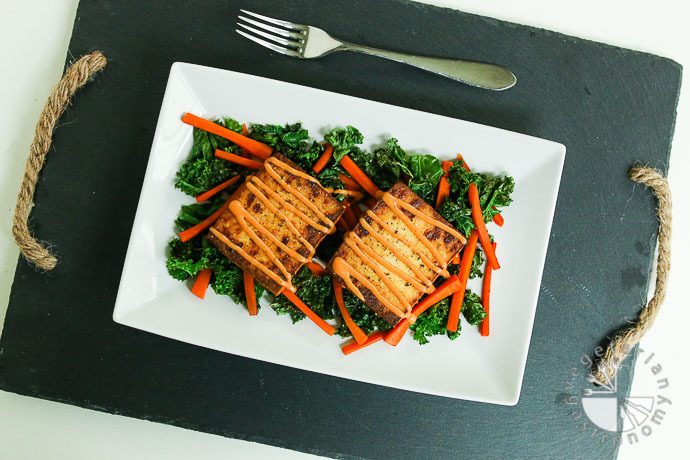 The kale and carrot should be mild in flavor, but feel free to add more maple syrup or brown rice vinegar if needed. 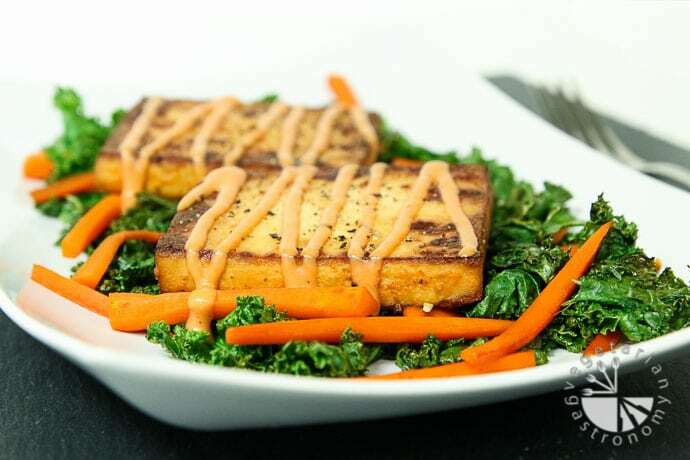 In the meantime prepare the baked tofu. 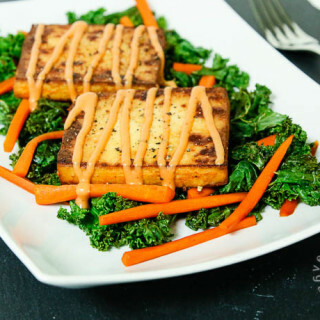 Slice the baked tofu slab in half to thin it out into two pieces. In another non-stick pan, heat 1/2 teasp oil on medium heat and add both pieces of baked tofu. Grill on one side until it starts to brown and get crispy. Flip and grill the other side. While grilling, sprinkle on some garlic powder sea salt, and freshly ground black pepper. Whisk all the ingredients for the Sriracha Sauce in a small bowl. 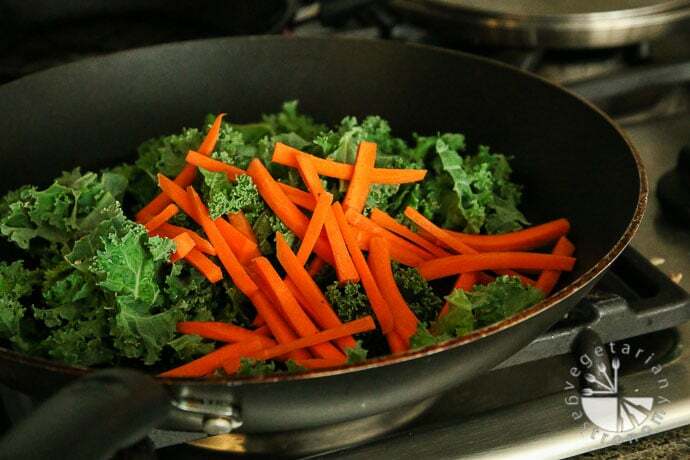 Plate the cooked kale and carrots. 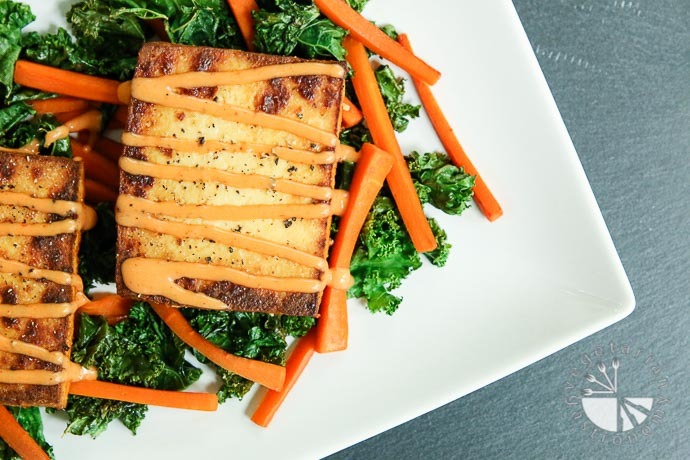 Top with both slices of crispy baked tofu. Drizzle some of the prepared Sriracha Sauce on top of the crispy tofu. Enjoy warm! 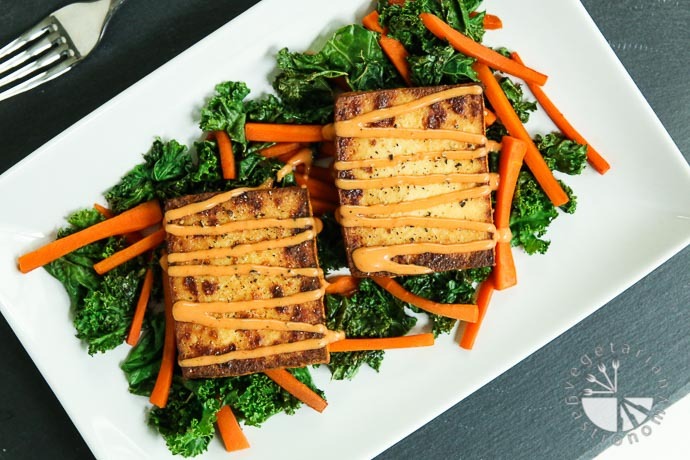 Organic Baked Tofu - I typically buy the pre-baked tofu from Trader Joe's or the grocery store. 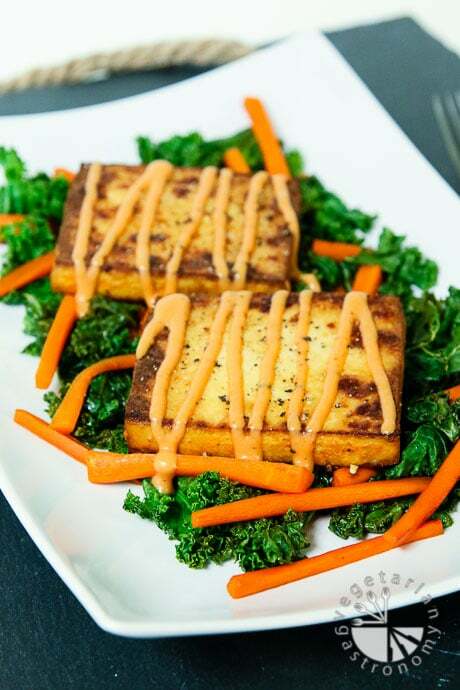 Get the teriyaki seasoned baked tofu if possible, otherwise the plain one will taste great as well. Thank you! 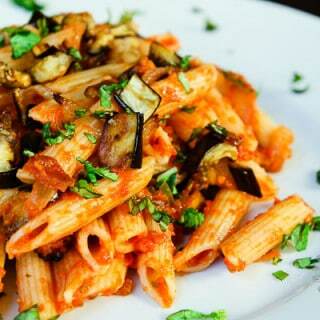 This dish is one of my favorite quick go-to meals for lunch or dinner! 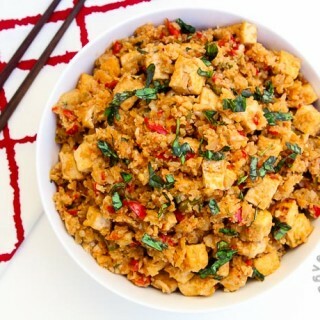 It's currently my favorite quick meal! I actually just made it for my kids a few days ago, and instead of using kale, I used spinach leaves based on what I had in the fridge. The texture using spinach isn't the same since the spinach cooks down pretty quickly, but my kids still loved it! Let me know what you think if you try it out. Thank you! 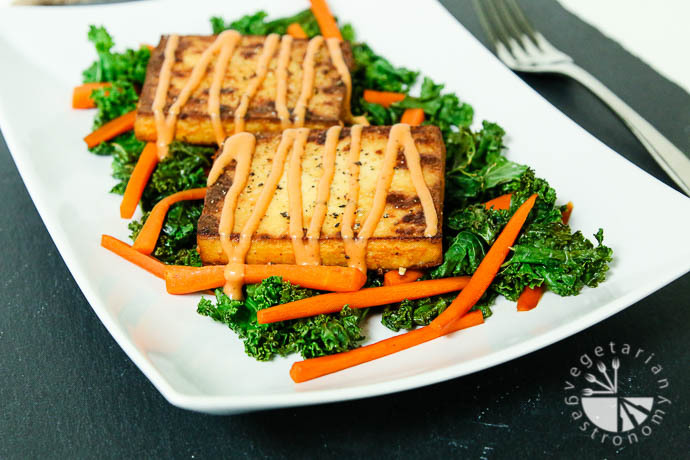 Grilled tofu tested so good with kale. Quick meal.